Glen Beasdale in Morar is a designated Special Area of Conservation (SAC) representing an coastal old sessile oak wood with Ilex on acid soils, with understory of heather (Calluna vulgaris), bilberry (Vaccinium myrtillus) and purple moor-grass (Molinia caerulea), and with birch woodland at higher altitudes. The area also includes open areas of acid heath, small areas of humid grassland and bog, and coastal cliffs with shingle and sandy beaches. The predominant habitat types are oak woods (62%) and heath (23%). The geology is Moine metamorphic rocks. 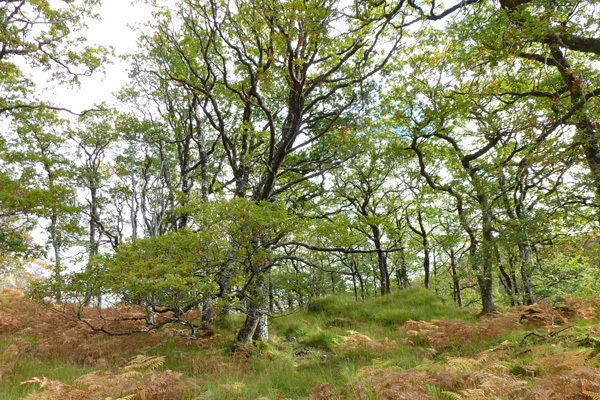 The acidic woodland at Glen Beasdale is ecologically distinct from the nearby oakwoods at Loch Moidart. Glen Beasdale is considered one of the best examples of Western acidic oak woodland in the UK. The oak woodland support a diversity and abundance of oceanic bryophytes of international importance, with over 200 species recorded, including seven national scarce species and the endemic Western Featherwort (Plagiochila atlantica), as well as a rich lichen flora of over 300 species. The woodlands have a rich fern flora, including butler and male ferns (Dryopteris species), hard fern (Blechnum spicant), hard shield fern (Polystichum aculeatum), brittle bladder fern (Cystopteris fragilis ), Lemon-scented fern (Oreopteris limbosperma), hart’s tongue fern (Aspenium scolopendrium), Rustyback (Asplenium ceterach) polyplody (Polypodium vulgare), Royal fern (Osmunda regalis), Oak fern (Gymnocarpium dryopteris) Wilson’s filmy fern (Hymenophyllum wilsonii) and Tunbridge filmy fern (Hymenophyllum tunbrigense). At higher altitude, the flora consists of Alpine lady’s mantle (Alchemilla alpine), Alpine bistort (Persicaria vivipara), Alpine meadow rue (Thalictrum alpinum), creeping willow (Salix repens), crowberry (Empetrum nigrum) and the arctic bladder wort (Utricularia stygia). Other notable species include Bog orchid (Hammarbya paludosa), Frog orchid (Dactylorhiza viridis), lesser twaybalde (Listera cordata), bog sedge (Carex limos), the nationally rare club sedge (Carex buxbaumii) and the hawkweeds (Caledonian hawkweed (Hieracium caledonicum), Uist hawkweed (Hieracium uisticola) and green-flowered hawkweed (Hieracium chloranthum)). The area support a range of woodland and moorland birds, corvids, raptors and waders and seabirds along the coast. The site is also noted for its population of otters along the coast and the freshwater pearl mussel (Margaritifera margaritifera). Mammals include pine marten, badger, wild cat, mountain hare, red deer, roe deer, stoat, weasel and otter. Butterflies include chequered skipper, marsh fritillary, dark green fritillary, pearl bordered and small pearl bordered, fritillary, ringlet, large heath and Scot Argus. Parts of Glen Beasdale can be accessed on the Glen Beasdale Walk.